For most people, the easiest way to brighten up the dark corners of a room is to use electric lights and lamps, but that does not always solve the problem. Luckily, there are multiple ways to brighten a dark room. In most cases, it’s the choice of the window shutters that helps people face the darkness more effectively. Also, the room direction and placement matters a lot in bringing the natural light inside the room. Choosing the right shutters for the windows of a room is a very significant way to make the room brighter. Some shutters are not that effective at letting light in. But like the bay window shutters, plantation shutters and other types of shutters are bright in colour and also allows light in. These are the best options to make the room brighter. Also, you don’t need to open the window wide to let the natural light come in, you can just open the shutters (if not permanently fixed) and enjoy the natural brightening of the room without making many efforts. It may sound like the obvious choice but the most prominent way to make a room brighter is this one. All of the other options opt for increasing the brightness of the room using natural lighting, but it is important to remember that you still have the option to go for the artificial extra lights. It can be a lamp on the table, or installing tube lights along the wall. Sometimes, when the room is large in size, one or two lights can still fail to make them brighter so going for additional lighting seems to be the best option in these cases. Some people go for really dark-coloured and thick curtains to cover their window. In cases like these, even if you have white shutters, the natural lights won’t come in, resulting in a much darker room condition. Therefore, choosing light coloured or and translucent curtains which allow the natural lights to come in through the window without having to pull off the curtains is something which homeowners can go for! It would definitely help them to shoo away the darkness of the room by a greater extent. It may sound a little weird but at times, even the old and dark furniture in the room can shell out a dark vibe and make the room look dull and even darker than normal. Also, wooden furnaces contribute more to this cause. It is recommended that you replace the furniture with light-coloured ones (most preferably white in shades) to make the room glow naturally. 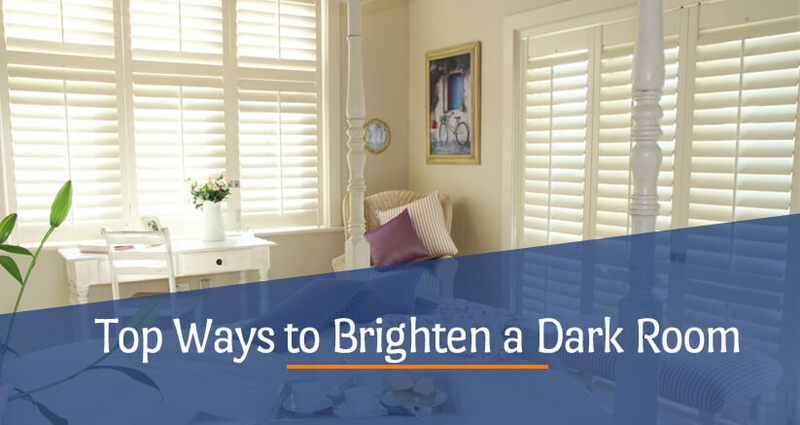 Whether it’s your roof ceiling surface, or the shutters for French doors, you must be aware of the fact that settling for dark coloured surfaces might actually block the path of the natural light entering the room. You must choose reflective surfaces like putting mirrors, using glass furnaces, and other decorative items which can reflect the light to the extent of making the room seem brighter. It works like magic when you put bright coloured rugs on the floor to compete with the darkness of the room. Obviously choosing the dark-coloured rugs would make the rooms darker and so, going for lighter coloured ones can help you brighten up the room by a greater extent. Some people eventually try to make their room darker as they find serenity in solitude and darkness, which can also set the mood for watching TV or cuddling in bed. But at times, the dullness can take over the mood of people. So, keeping room brightening options at hand so that you can implement them whenever you want is the most obvious choice and the above-mentioned ways depict some awesome ideas for the same.